Timo Boll (German pronunciation: [ˈtiːmo ˈbɔl]; born 8 March 1981) is a German professional table tennis player who plays with Borussia Düsseldorf and his ranking is second in the German Table Tennis National League. His ranking is No. 5 in the ITTF world rankings as of March 2019. Boll ranks among the best German table tennis players of all time, having ranked world No. 1 in 2003, 2011 and in March 2018. Boll was born in Erbach im Odenwald, Hessen. At the age of four, Boll was playing table tennis and at that time was coached by his father. In 1987, he became a member of TSV Höchst and played there at association level. At the age of eight years, he was discovered by Helmut Hampel, a Hessian trainer who promoted him. In 1990, he started to train at the training centre Pfungstadt and four years later changed teams to FTG Frankfurt [de] with whom he took part in the Second Division, at which time he attracted the attentions of other table tennis associations. TTV Gönnern [de] recruited him in 1995, a move which required the entire team to relocate 170 km away, to Höchst, to enable daily training with the then 14-year-old Boll. Boll was placed in position five on the team but, nevertheless, lost only one match in the whole season. This contributed to the elevation of the team to the table tennis national league's Tischtennis-Bundesliga (First Division). At the age of 14, Timo Boll held the title of youngest player in the national league (A title he shares with Frank Klitzsch). He celebrated his first international success during the Table Tennis European Youth Championships in The Hague in 1995, where he won three gold medals. In 1996, he was a runner up in the Junior Boys Singles of that same competition, but then went on to win the singles title in 1997 and 1998, as well the doubles title in 1998. He finished school with a secondary school level I certificate. In 2002, Timo Boll became the first German player to win the Europe-Top-12-Tournament beating Vladimir Samsonov in the final. Boll also became the 10th best German player, according to the ITTF Rankings, overtaking Jörg Roßkopf. During the European Table Tennis Championships in Zagreb, Boll won both the singles and the doubles with Zoltan Fejer-Konnerth. The German team featuring Boll was defeated in the final by the Swedish team with a score of 2–3. 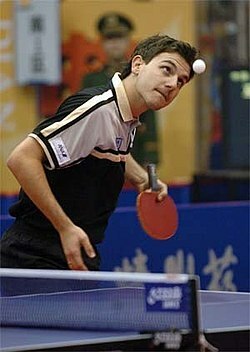 With his victory in the 2002 Table Tennis World Cup held in Jinan, China (where he beat the world champion Wang Liqin and the Olympic champion Kong Linghui), Timo Boll finished the year as the highest ranked player in the world. During the European Championship of 2003, Vladimir Samsonov led the Belarusian team to victory in the final against the German team. After his elimination during the second round of the singles competition, Boll lost his number one position in the world table tennis rankings. Back problems troubled Boll during the first half of 2004. These problems handicapped his preparation for the 2004 Summer Olympics, in which he was outclassed in the quarterfinal by Jan-Ove Waldner. After a period marked by public criticism, Timo Boll won tournament victories in Poland, Austria, and Germany. He also reached the semifinal of the Pro Tour in Peking, where he was edged out 3–4 in games by Ma Lin. Early in the 2005 season, Boll's back problems struck again; nevertheless, he won the silver medal in doubles at the World Championship, playing with Christian Süß. He was awarded the Fair Play Award from the ITTF after a referee’s decision was reversed in favor of his opponent during the knockout rounds of that competition, leading to a defeat. The year ended well, as he won the Champions League with TTV RE-BAU Gönnern [de], and the Table Tennis World Cup in Liège in Belgium, in which he defeated all three Chinese first-class players. In 2007, he won the European Championship in singles, doubles, and in the team competition. In December 2006, Timo Boll signed a 3-year contract with Borussia Dusseldorf [de], the current championship record-holding team, due to his former team’s financial situation and loss of key players. Boll also moved in light of the upcoming Olympic Games 2008 and the possibility to train there with his doubles partner, Christian Süß. His 3-year contract with Borussia Düsseldorf began on July 1, 2007, with stipulations allowing him to miss certain Bundesliga matches in order to focus on international tournaments. His contract was later extended until 2022. In 2007, he won the European Championship singles, doubles, and in the team competition. He was also active as a guest player in the Chinese Super League. During the 2008 Summer Olympics in Beijing, he participated again with the German national team. After victories over Croatia, Canada, Singapore and Japan in preliminary rounds and the semi-final, the team lost 0–3 against the host Chinese team. As the top-ranked player in 2008, Boll successfully defended his three European Champion titles from the previous year. At the 2012 Summer Olympics, Boll lost in the last 16 to Adrian Crisan but the German team won the bronze medal in the men's team event, losing to China in their semi-final but beating Hong Kong in the bronze medal deciding match. At the 2016 Summer Olympics, Boll along with partners Bastian Steger and Dimitrij Ovtcharov won the bronze medal at the team event. Back problems led Boll to not participate in the 2008 and 2009 World Championships in China and Japan respectively. At the 2008 World Cup in Liège, he scored a semi-final victory over Ma Long but lost out in the final against Wang Hao, winning a silver medal. At the beginning of 2011, Timo Boll was back at the top of the world rankings, having beaten Ma Lin in the Volkswagen Cup final. In April 2011, he was replaced as #1 by Wang Hao. At the 2011 World Table Tennis Championships in Rotterdam, Boll won his first singles medal in that competition, a bronze medal, after being beaten 4:1 by world champion, Zhang Jike. During this championship, Boll declined to compete in doubles and team matches, focussing instead on the singles competition. Playing for the German national team, Boll received silver medals at both the Team World Championships 2010 in Moscow and the 2012 championships in Dortmund, losing out both times to the Chinese team. Boll won another eight titles at the European Table Tennis Championships in 2009, 2010, 2011 and 2018. Timo Boll is a left-handed player whose best weapon is his forehand topspin drive but is also noted for his extremely quick backhand loop. His blade is the "Timo Boll ALC" with Tenergy 05 rubbers on both sides. His present doubles partner is Ma Long. On July 1, 2007, his three-year contract began with Borussia Düsseldorf. Timo Boll married his longtime girlfriend, Rodelia Jacobi, on December 31, 2002. ITTF Pro Tour (19) and Grand Finals (1): Brasil 2001, Austria 2002, Japan 2003, Poland, Germany and Austria 2004, Japan, Sweden and Grand Finals 2005, China, Germany and Poland 2006, Austria, Germany and Poland 2008, Qatar, Germany, and Poland 2009, Japan 2010, Korea 2017. Team: 2nd position Olympic Games 2008; 3rd position Olympic Games 2012, 2016; 2nd position European Championship 2000, 2002, 2003, 2014, 2nd position World Championship 2004, 2010, 2012, 2014; 3rd position World Championship 2006. ^ a b "World ranking Record for BOLL Timo (GER)". ittf.com. Archived from the original on October 17, 2012. Retrieved June 4, 2011. ^ a b c d "BOLL Timo". ittf.com. Archived from the original on October 17, 2012. Retrieved June 4, 2011. ^ "Timo Boll, once again on top of the world - International Table Tennis Federation". International Table Tennis Federation. February 27, 2018. Retrieved September 3, 2018. ^ "ETTU.org - History - Results". www.ettu.org (in German). Retrieved September 4, 2018. ^ "Boll verlängert in Düsseldorf - TTBL". ttbl.de (in German). Retrieved September 7, 2018. ^ "'Table tennis is becoming a major professional sport' - The Sunday Guardian Live". The Sunday Guardian Live. July 14, 2018. Retrieved September 11, 2018. ^ "Timo Boll's Performances Recognised by German Journalists". ITTF. December 22, 2008. Archived from the original on October 3, 2012. Retrieved October 10, 2010. ^ "Unstoppable Timo BOLL at LIEBHERR Top-12: he's legend". tabletennis.gr. February 7, 2010. Archived from the original on September 13, 2012. Retrieved October 10, 2010. Wikimedia Commons has media related to Timo Boll. This page was last edited on 12 April 2019, at 02:23 (UTC).